A few years back I was casually shopping at one of my favorite gun shops and I stumbled across an IWI Baby Eagle also known in Israel as the Jericho. I found myself instantly intrigued by the pistol and asked the salesman behind the counter if I could look at it. As I stood there fondling the pistol the salesman looked at me and said "Jews make good guns". His statement, although not exactly politically correct instantly popped into my head the first time I had a chance to shoulder an IWI Tavor. This may be a bold statement, but the Israeli engineers at IWI may have just perfected the bull pup design with their Tavor line. This review is going to be based on my first impressions of the Tavor and will be followed up in the near future with a range report, letting everyone know how the Tavor performs in the real world. When you get ready to lay down your hard earned cash for a new Tavor you are going to be faced with a few options. The Tavor comes in two barrel lengths, 16" and 18". There are also few color choices which include black, flat dark earth and just recently released green, which still seems to be a little more difficult to find. Originally 5.56 was the only caliber option, but now there is 9mm version available for anyone interested in a pistol caliber carbine. If you do decide to go with the 5.56 version there is 9mm conversion kit available. IWI also offers the "IDF" model, this will be similar to the rifle issued to the Israel Defense Forces (IDF). The IDF model comes with a Meprolight Mepro 21 mounted on the rifle. The only downfall with the IDF model is that you lose the full length rail that comes standard on all of the other Tavor models. I wanted to keep my Tavor as short and compact as possible so I opted for the 16" barrel and the gun shop I ordered from was able to find me one in the new green. What impresses me most about the Tavor are the ergonomics. No matter what your stature it seems to shoulder the same for everyone. When I last took it to the range a swarm of shooters wanted to check it out and each person that handled it commented on how comfortable it was. The placement of the controls seems to have been very well thought out as well and are almost effortless to operate. 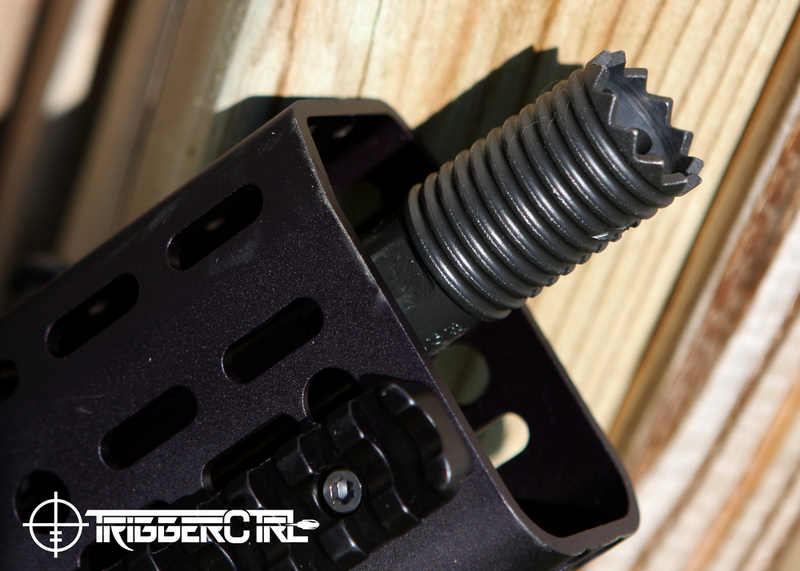 The mag release lever is directly behind the grip and is extremely easy to manipulate. Drive a fresh mag home and the placement of the bolt carrier stop makes it almost impossible to miss after the mag has been seated. 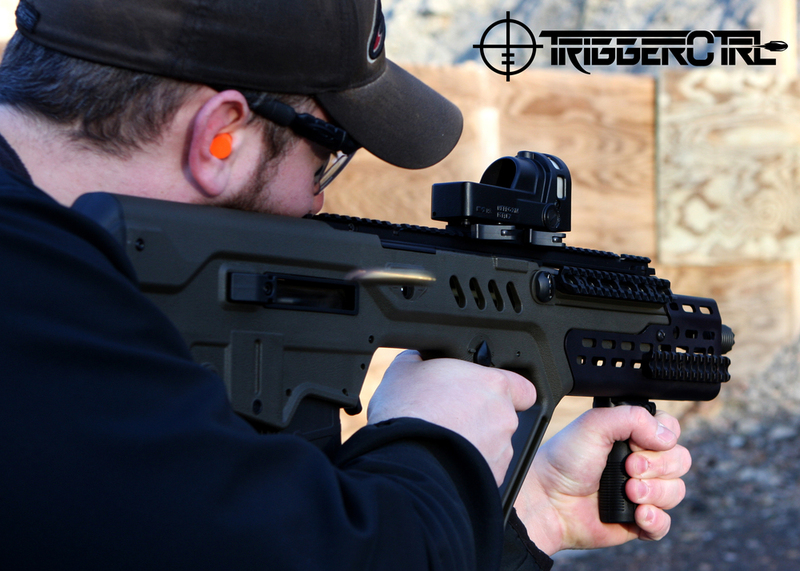 The Tavor is no light weight coming in at 7.9lbs, but as soon as you shoulder the Tavor the weight seems to disappear. This can be credited to the compact size of the rifle which keeps all of the weight very well balanced and close to your body. Recoil with 5.56 is almost nonexistent and there is just about zero muzzle rise which keeps you right on target for very quick follow up shots. The compact size of the Tavor along with the short sight radius makes transition from target to target instantaneous. I cannot believe how effortless it is, at first you will find yourself over running every target until you get used to it. For competitors shooting any type of rifle competition using multiple targets this is going to shave off some serious time from their overall score. For increased accuracy the Tavor 5.56 barrel is cold hammer-forged and chrome-lined with 1:7 twist and is fully detachable. The Tavor was designed to take standard AR mags and you will find a 30 round PMAG magazine in the box. This for a lot of shooters will be very convenient, especially if they already have a pile of AR mags at home and just about every gun shop has a large assortment of AR mags on their shelves. Also included with your purchase will be two quick detach push button swivels that can be used to attach your sling to the front and rear ambidextrous sling receptacles. The included full length rail atop the Tavor will accept all of your favorite rail mounted optics and accessories to make you feel right at home when it comes time to upgrade your rifle. Everyone knows that there is no such thing as a perfect rifle and the Tavor does have a few negative points. First off the Tavor may cause a little sticker shock. With an MSRP of $1999 it is priced in the realm of high end AR's, but you do get what you pay for. The next few things are really not the fault of the Tavor but more of the bullpup design. With the ejection port behind the grip you are going to see the casings eject in the corner of your peripheral, this may not bother some and is definitely not a game changer, it just takes some getting used to. Also, with your nose right on top of the muzzle you are going to notice with the stock bird cage muzzle brake the report of each shot is right in your face. This problem was easily remedied with the addition of a muzzle brake that forces the blast down range. Now for the biggest downfall of the Tavor, the trigger. The trigger is mediocre for a combat trigger at best. It is long, extremely heavy with a very gritty feel. Both Geissele and Timney have drop in trigger kits available that are supposed make a night and day difference. I have had very good luck with Geissele triggers in the past so expect to see a review of Geissele trigger in the near future. Now for the fun part, time to upgrade. For me getting a new gun is like playing with adult Legos and I just cannot leave good enough alone. The Tavor aftermarket is definitely nowhere near as flooded as the AR world, but there are some very high quality options out there. The Tavor comes with a very nice set of back up sights that are very well incorporated into the rail and the front sight has a tritium insert, but they are still just back up sights. I decided to keep with the Israeli theme and opted for a Meprolight Mepro 21. This is a very robust holographic optic that fits right at home atop the Tavor. With my shooting style I like to use a vertical grip so I needed to find a forend to mount it to. This is one item that is very limited for the Tavor, but Manticore Arms made my search very simple. 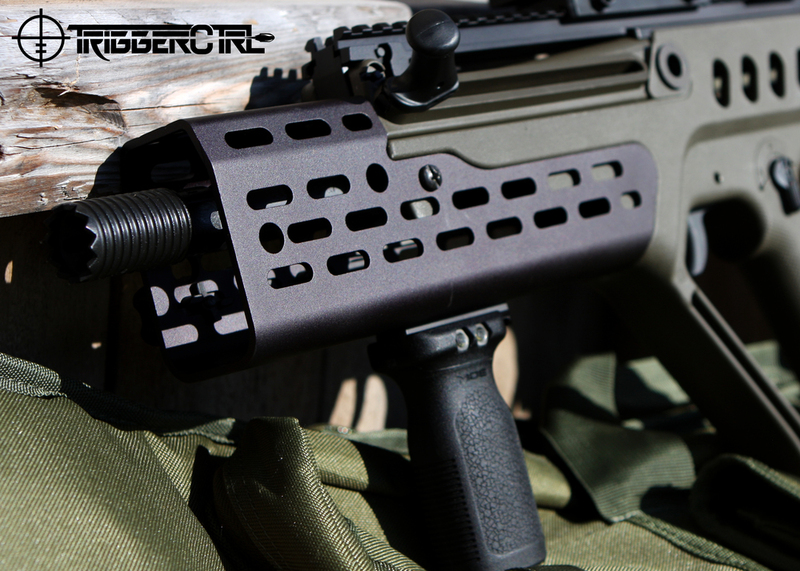 Manticore has a full line of hop up parts for the Tavor and many other rifles. Everything they sell seems to be very high quality with near perfect fit and finish and the Manticore XTL forend I went with did not disappoint. The XTL was very easy to mount and looks like it belongs on the front of the Tavor, if people did not know better they would think this forend was OEM. Finally, I mounted a Troy Claymore muzzle brake and this brake instantly cured the muzzle blast in your face issue I was having. The Claymore not only looks cool, but it does an amazing job of directing the blast down range unlike the stock birdcage the rifle came with. As soon as I decide which trigger upgrade to go with I am definite I will have a near perfect rifle in my arsenal. I am very impressed with the product that IWI has put on the market and could not be happier with my purchase. So if you are looking for a rifle to set you apart from all of the cookie cutter AR's at your next 3-gun match or are just looking for a new rifle to go plink with take a look at the IWI Tavor. The bull pup design takes some getting used to, but with the Tavor you will be addicted in no time.